Whenever I discuss the cult of Dionysos I always add a plural, cults. There is no one authoritative singularity of the expressions of Dionysos. Throughout history people have viewed multiple identities of the god, even at the same time and place. For example there are references of two temples being side by side both dedicated to Dionysos, each dedicated to a specific aspect of Dionysos. Each with their own cultus, methods of worship, taboos, decorum and practice, yet they worshipped the same god. This is just one example in one city with differing cults. Imagine that across the entire Hellenic world. Athens is often the default location to look at for Hellenic polytheists, but as we look outwards from there we see regional differences. In the barbaric north of Thracia and Macedonia the Dionysian expression is much more wild: involving hunts and practices which can be related to shamanism. To the west in Magna Graecia, the “Mecca” of Dionysos, the god plays a prominent role in everyday life with a emphasis on the deathly side of Dionysos. His place in this land is so strong that much of the artwork from there was dedicated to him. This is a trait found within liberal polytheist cultures. When we look at monotheistic religions there is an orthodoxy in practice, only *one* legit way to honour and view god. Yet, when with the Greeks they allowed open interpretations of practice, this is usually regarded as the difference between orthodoxy and orthopraxis. This environment invites regional cults and differing belief systems. As a specific difference in cultic identities the most obvious in the Orphic religion. A belief system that claims to be derived from the hero, Orpheus. Even within Orphism there are variants that range from location and teacher. I’ve been studying this unique aspect of Hellenic religion for a long time now (5 years?) and even after all this research I cannot illustrate an absolute “common core” of their beliefs. In general, however, it is believed that that soul has a divine component which needs to be ‘unlocked’ to rest eternally in bliss. Most of the time this divine aspect is Dionysian in nature. 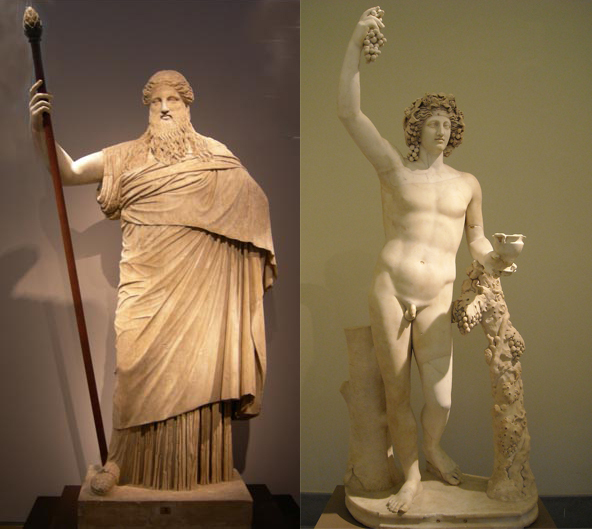 Co-existing with the Orphics is the Dionysian Artists, this was a sacred guild based in Athens but spread throughout the Hellenic world, including Egypt and Italy. I’ve written extensively on this guild and continue to do so. The identity that this guild mostly dealt with was the God of the Theatre. So when examining ancient Hellenic culture it is key to keep in mind that the way people viewed the gods varied on circumstance, even in the same location and amongst the same people.